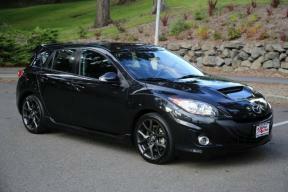 2013 Mazdaspeed 3 "Mr. Toad"
Mr. Toad, my Wild Ride. 2011 Mazda 3 S "Zoom-Zoom"
I never seriously thought that I would buy a non-European car for myself, but when the Passat came due for assorted repairs that exceeded its value I started looking around. Key requirements were (1) three pedals, including a clutch and the associated gearbox, and (2) interior space for a dog or the occasional "stuff" consistent with a station wagon or something close. 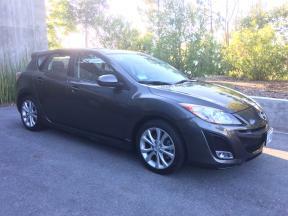 To my surprise, that led me not to another Volkswagen but to a Mazda 3, which not only is an adequate daily-driver but is awfully fun to drive, too, possibly the best-handling car of any car that I have owned. Kathy and I bought this car in preparation for Libby's arrival. It had the Audi 2.8-litre V6 engine, so it was quite fast and fun to drive. Kathy usually drove it until she got her Prius. 1953 Morgan +4 "The Flying Haggis"
A veteran of the 1988, 1989, and 1990 runs of La Carrera Panamericana, the Mexican Road Race. I bought it in 1999 and hope to do some vintage racing with it. Kathy bought her Z3 after years of practical cars, having realized that a fuel-efficient four-seater added little real value for short commutes with no passengers. She soon discovered that convertibles weren't just for sunny days - they're great for enjoying starry nights! This realization played a prominent role in our meeting. While good for solo commuting in California, a Z3 is not good for kids, so Libby's arrival contributed to the Z3's reluctant departure. This was Kathy's practical car, then my daily-driver after she got the Passat. While not the most exciting car, it could actually take nearby freeway ramps faster in it than the Morgan. In traffic, air conditioning and decent tunes were nice, too. With over 107,000 miles, it was finally replaced by Kathy's Prius. This was Krissie's car. Once, on a trip down US 101 to Los Angeles, we averaged 52 MPG! The Honda became my everyday commute car after Krissie died until I donated it in June 2000. I liked the BMW 320i from the first time I saw one, but they were anemic. The 323i is a European-model, never imported officially to North America, which has a 2.3-liter inline six instead of the 320i's 2.0-liter (1.8 in later years) inline four. 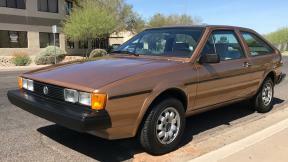 This is the only car I bought new for myself—so I had reliable transportation when I started my first job out of school. Alas, that job was in Pittsburgh, Pennsylvania, so the car's first few years were pretty rough, and it accumulated many battle scars. For a long time it was a good "take the dog to the beach" car, but I finally found it another home in 2000. In better days, it looked like this twin (pictured at right). Copyright © 1999,2001-2004,2007,2008,2015,2017-2019 Karl L. Swartz. All rights reserved. Road signs courtesy and copyright © .